This forum belong to the Stratford-upon-Avon Canal. One of my favourite fishing venues as a lad were the Pounds at Lapworth. These were two relatively small areas of holding water to support the lock system that ran along this canal length and they were directly alongside the canal itself one being at a higher level than the other with a weir to take excess water from the top pound to the lower pound with a difference in height of about 8 feet. It was always one of the best spots to fish at the bottom of this weir overflow and invariably it was occupied by the time I had cycled the 5 or 6 miles from my home on a Sunday morning. However the fishing in the Pounds was generally good and the setting quite lovely with lush grass banks to sit on underneath some fine trees to the lower pound. In the corner of the lower pound lay a dozen or so rotting canal barges of the type that had been pulled by horses that had long since sunk and with a bank side lined interspersed with rushes and weed including the odd lily patch you were greeted with a water that said you would find fish at home. Many sunny days were spent fishing there after saving the 6 shillings (I think) for the junior BAA licence (it was a BAA controlled water at the time). The lower pound was renowned for some fine roach and the top pound for some fine bream. A schoolfriend managed a 1lb 2oz roach from the lower pound down by the sunken barges with his Apollo Taperflash and Rapidex - float fishing with two maggots on an 18 hook (one yellow one white). After his capture of this magnificant fish we all float fished the two maggot combination on an 18 hook but I never saw another roach over 1lb from the venue. In the early 1970s I fished the top pound for bream with my Billy Lane Match Rod and Mitchell 308 with float fished bread flake managing to take bream up to 4lbs. The top pound was not accessible to any boat traffic and in fact few boats were seen in the 1960s and 1970s. It was not till the late 1980s that a friend of mine, Chris, said he fancied some canal fishing for bream and did I have any suggestions. The top pound at Lapworth lept to mind and although I had not visited for close on 20 years I made some enquiries to discover that the water had been taken over by another Angling Club and that day tickets were available. We decided to fish mid-week and with the Billy Lane Rod and Mitchell packed with a pint of maggots each and half a loaf we set off in glorious weather to Lapworth. When we got there it all looked a bit sad to how I remembered it. Whilst the top pound was similar to what I recalled the bottom pound had had the old sunken barges removed, the rushes had gone, together with the weed and lily pads. Instead it was clear that the bottom pound had been dredged as lay on the two sides of the bank was approximately 5 feet of solidified grey mud dredgings. Not to worry we had come to catch bream so we set up on the top pound and started fishing catching a few small bream and generally enjoying the glorious sunshine. Lunch was taken on the bankside at around 1.00pm and as we both had decent chairs my colleague said he fancied a nap. He reeled his gear in and was soon sound asleep. I fished on and took a few more small fish before I too reeled in and decided to have a walk around the bottom pound. The bottom pound had never been fishable on the one side due to extensive vegetation but the dredging operation had also included the clearing of this area so I thought it worth investigating as when we were lads it was always suggested that the really big roach inhabited this unfishable area. All I need to do was to walk the few yards from the top pound down the grass path and then walk across the dredged mud to get a decent look at this area which had held its secrets for so long. It was only a matter of minutes and as I walked across the solidified mud dredgings all seemed well until as I neared the edge of the pound the crust gave way and I dropped like the preverbial stone through the dredgings which were semi liquid under the crust. Everything settled down with me having thrown my arms out and the crust instead of being under my feet was now under my arm pits. I called out repeatedly for help but none came and Chris (remember Chris my fishing companion for the day) was sound asleep in the afternoon sunshine in his chair only some 20 yards distant. It took me over 45 minutes to wade through the semi-liquified dredgings that emitted the most appalling odour and no matter what I tried I could not haul myself up on to the crust. I was utterly exhausted by the time I reached dry land and as I staggered up the footpath I was covered from feet to underside of armpits in a coating of this foul smelling grey sludge. There was Chris still fast asleep in his chair so I woke him gently and as his eyes focused and his nose detected something evil he leapt up and said 'Bloody hell what happened to you?' I related the tale and my total disappointment that he had slept through my hollerings for assistance. He moved his gear another 10 yards along the bank to distance himself from the smell that was me and at regular intervals for the balance of the day he would burst into bouts of uncontollable laughter. I sat there until it was time to pack up removing pieces of formerly semi-liquid dredging as it dried out in the sunshine but inspection revealed it had permeated through all my clothes embalming my delicate body in its foulness. I washed as much of my stuff in the canal as I could without being arrested but the power of the odour was such that it was only marginally diminished and as the sun began to move towards the horizon the realisation now took hold of Chris that he and I had a 30 mile journey back in the car on what had been a very warm day. I had a couple of old bin sacks which I managed to form into a sort of oversuit so as not to wreck the vehicle upholstery and with all the windows open including the sun roof a 30 mile dash home took place interspersed yet again with uproarious laughter as he looked across at me sat there in black plastic bin liners. I went back to have a look at Lapworth Pounds a couple of years ago to see that both the top and bottom pound were now being used to moor leisure barges. Gone are soft grassed banks, rushes, lilies and weed beds, gone are most of the trees, gone is the magic of it as a fishing venue. Instead it is replaced with wooden staging, metal supports and piling and numerous pleasure craft. As they say you should never return to fishing venues after too many years of not visiting - the changes are always too much and generally for the worse. I do wonder though did anyone else on here have the pleasure of fishing Lapworth Pounds when it was a joy to be there? I fished it a bit during my school years in the early 70's. I remember it exactly as you describe. I never did particularly well there, but do remember it being a very pleasant place to fish, apart from the wasp nest on the upper pound that seemed to be there every year. most times, though, I walked past the pounds and fished along the Stratford canal where I usually caught plenty of gudgeon plus the odd roach and small perch. I don't live in the area now, but still have family a few miles away. I haven't looked at the pounds for at least 20 years and I've been meaning to go back to have a look on one of my visits, but perhaps I wont now as it has changed the way you've described. The article submitted by Pershore Harrier also had me recollecting some of the Lapworth outings of years ago, my favourite swim at the time was the bottom of the weir that connects the two pounds that he describes in his article. I've had double figure bags of quality roach on the caster or chrysalis as they were called in those days. 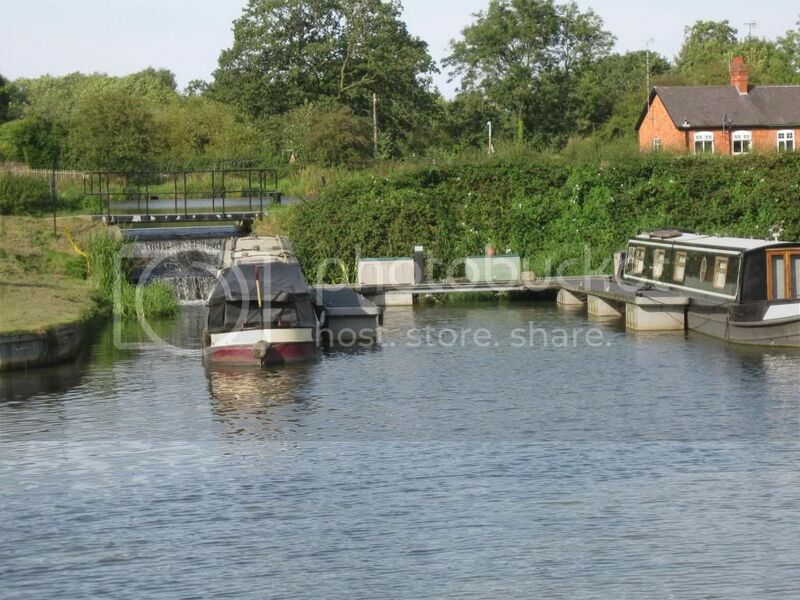 The short canal section that joined the second pound to the Grand Union has also been has also been raped by the powers that be with the rushes ripped out and replaced by sheathing that now makes it a featureless boat chanel. I submit a photo of what I considered to be Lapworths finest peg now complete with boat moorings.